MarketGoo operates in the B2B SaaS industry and we’ve achieved a significant number of partnerships and growth over the years. We are a bootstrapped company, founded in Spain, which is not the best-known tech hub (or at least it wasn’t 6 years ago) and we provide an SEO solution. Back then, the idea sounded a little crazy and we received honest feedback advising us to avoid SEO as it was a crowded and competitive space. But we had a plan: we had some experience in the SEO field but most importantly, we knew our niche market very well. 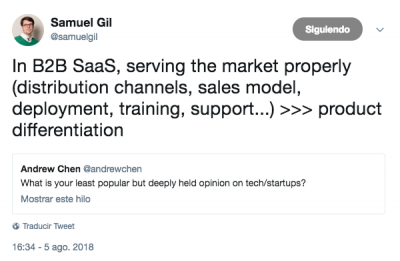 Sometimes, I receive questions from founders trying to offer B2B SaaS solutions to SMB providers and Hosting companies and I almost always feel the same way: founders tend to think that their product differentiation is going to make them very successful. But sorry to say, based on our experience, you need to have a good enough product but your differentiation will come from understanding and serving your market properly. One of the early drivers of our success was that our product was a natural fit for the Hosting channel and SMB marketplaces. We understood why this channel would be receptive, and we also understood how they, in turn, would commercialize our tool to their own userbase. There was no struggle there (not to say we haven’t had our own set of challenges) because like I’ve mentioned, we saw a clear opportunity and had confidence from understanding the market extremely well before taking the plunge with MarketGoo. Distribution channels: we’ve chosen to partner with SMB providers mainly instead of going directly to end-users. Going direct means burning a lot of cash in acquisition and we saw a clear opportunity in the Hosting space as we had been running other projects before. We choose not to compete against our partners so we provided them with white-label solutions. Obviously, we shared in revenue. Sales Model: We use an internal team of Sales Execs to create partnerships. Partners then re-sell our solutions. We also have a wide presence in marketplaces and affiliate partnerships, among other channels. Product and Pricing: we do all kinds of Pricing strategies and provide different value-based products for different types of strategies (retention strategies, up-sell strategies, bundles, etc). Integration: We integrate with our partner’s platforms but also integrate into marketplaces or provide part of our USP through APIs with integration tools like provisioning API, data API, communications engine, etc. Training: We see our Partner as a market so we help them to understand our Product and leverage our experience. We perform training for sales, marketing, and support teams, etc. Support: Lots of efforts made on Customer and Partner success to keep user satisfaction high. Regarding the above-mentioned Distribution Channels and Sales Models, the way we’ve approached these fit in with mantra of Product-Channel and Channel-Model fit being more critical to success than just ‘building a great product’ that will ‘sell itself’ – continuously scrambling to add new features as a fix-all was something that we didn’t (and don’t) want to be doing. After 6 years it’s become clear to us that running a B2B SaaS business is not just a matter of focusing on differentiating your product but being able to serve the market properly.